Whisk dry ingredients together thoroughly in a large mixing bowl. Cut in the shortening until mixture looks like coarse crumbs. Add milk and mix until dough just sticks together. Knead the dough on a lightly floured surface about 10 strokes. Roll into a circle about 1/2-inch thick. 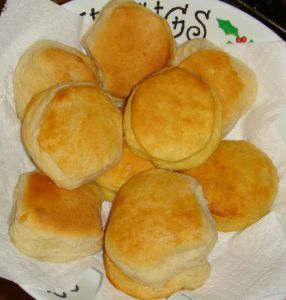 Cut biscuits and place on lightly greased or sprayed baking pan. Bake at 450° F for 10 to 12 minutes or until golden brown.